Vivek Sarkar is a Research Professor at Rice University. He is also a Professor in the School of Computer Science, and the Stephen Fleming Chair for Telecommunications in the College of Computing at Georgia Institute of Technology. At Rice, he leads the Pliny project on “big code” analytics in the DARPA MUSE program. Prior to moving to Georgia Tech in August 2017, Vivek was the E.D. Butcher Chair of Engineering and Professor of Computer Science at Rice University, where he created the Habanero Extreme Scale Software Research Laboratory with the goal of unifying elements of high-end computing,multicore, and embedded software stacks so as to produce portable software that can run unchanged on a range of homogeneous and heterogeneous extreme scale platforms. He also served as Chair of the Department of Computer Science at Rice during 2013 – 2016. At Rice, Prof. Sarkar taught the undergraduate class on Fundamentals of Parallel Programming (COMP 322) in the spring semesters during 2011-2017. He also teaches the Rice Online specialization on Parallel, Concurrent, and Distributed Programming on Coursera. 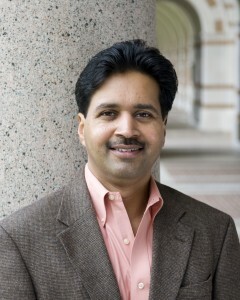 Prior to joining Rice in July 2007, Vivek was Senior Manager of Programming Technologies at IBM Research. His responsibilities at IBM included leading IBM’s research efforts in programming model, tools, and productivity in the PERCS project during 2002- 2007 as part of the DARPA High Productivity Computing System program. His prior research projects include the X10 programming language, the Jikes Research Virtual Machine for the Java language, the ASTI optimizer used in IBM’s XL Fortran product compilers, the PTRAN automatic parallelization system, and profile-directed partitioning and scheduling of Sisal programs. In 1997, he was on sabbatical as a visiting associate professor at MIT, where he was a founding member of the MIT Raw multicore project. Vivek became a member of the IBM Academy of Technology in 1995, the E.D. Butcher Chair in Engineering at Rice University in 2007, and was inducted as an ACM Fellow in 2008. He holds a B.Tech. degree from the Indian Institute of Technology, Kanpur, an M.S. degree from University of Wisconsin-Madison, and a Ph.D. from Stanford University. Vivek has been serving as a member of the US Department of Energy’s Advanced Scientific Computing Advisory Committee (ASCAC) since 2009, and on CRA’s Board of Directors since 2015. Dr. Sarkar’s curriculum vitae (CV) can be found here.